My name is Cierra, and I am a visual artist. I spend most of my time working on new art projects. My interests lie mostly in creative writing, painting, and drawing. I derive ideas from a wide range of sources—pop culture, people, nature. I received a Bachelor's degree in Studio Art from Capital University, where I studied design, digital printmaking, ceramics, sculpture, video production, and more. Hi, my name is Lisa and I am co-owner of the Brush Crazy studio in Columbus, Ohio with my sister Lori. I have always enjoyed art and painting from an early age and took several classes at the Columbus College of Art and Design. It has always been a dream of mine to have a job that would allow me more time to spend on this passion and to help others experience joy. I am so happy to be opening a small business with my sister in the city I have lived my entire life. In my spare time I enjoy spending time with family and friends, helping out in the community and working with Job's Daughters youth group. Hi, I am Lori, co-owner of Brush Crazy in Columbus, Ohio. I was married to Steve for 32 years, and 26 of those years I traveled the world as an Air Force spouse. We raised 2 wonderful boys, but after Steve’s tragic death due to cancer, I needed a new direction. My sister Lisa (the other co-owner) was the answer. 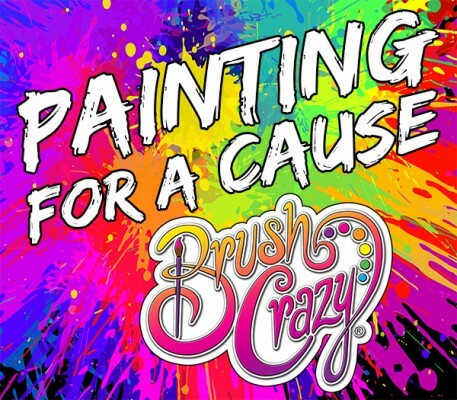 We both decided to do something we love…we found Brush Crazy! I am happy to be back in my hometown, creating a friendly environment for others to create their own special masterpieces. Once upon a time there was a girl who was terrified of student loan debt and liked food too much to become a starving artist. Rather than attending art college she became an accounting clerk, where she remained until Brush Crazy rescued her. Pamela is a long-time Columbus resident with degrees in Fine Art and Music from Capital University. She and her husband and the happy dog parents of two rescued dachshund mixes. Pamela, in addition to her interest in fine art, is an avid reader, sometimes crafter/diy-er, and occasional performer. She enjoys doing theater at a community level when she has time and was most recently in the musical Splendora with Cyclodrama at Club Diversity. Grew up in NE Ohio, graduated with a B.S. degree in Communications from The Ohio State University. Later, received an Information Technology degree from Devry. I have lived most of my life in Columbus, Ohio. When not working, often spending time hanging out with my dog, out riding or visiting a local farmers market.